Globe Electric's 4" Damp Rated Shower Recessed Lighting Kit with round tempered frosted glass and white finish is the perfect way to brighten bathrooms with style. 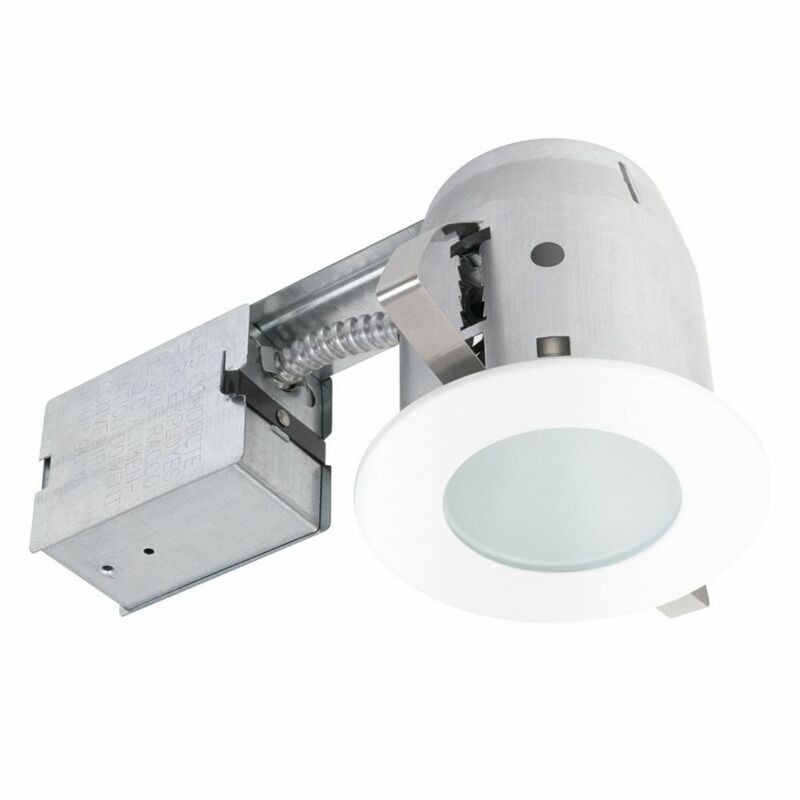 Designed with a water resistant seal to protect bulbs from humidity the pot light's housing and frosted glass trim are a perfect choice for damp locations like bathrooms, showers and saunas. Featuring patented PUSH-N-CLICK clips to grip uneven holds and surfaces installation is tool-free and easy. Fast and easy to install this kit is sure to save you time and money. Contractors agree! Requires one 35W equivalent MR16 GU10 light bulb (sold separately). Dimmable with compatible bulb and dimmer switch. The silicone gasket on this item is the seal between the glass lens and the trim. It is pre-sealed to help prevent moisture from entering the housing. EnduroShield is an Easy Clean surface treatment for glass that cuts cleaning time by up to 90%. A single application lasts beyond 3 years. Suitable for all indoor and outdoor glass surfaces including new or existing shower doors, mirrors, windows, doors, railings and backsplashes. Application is simple: clean the surface with the included EnduroClean pre cleaner (and fine steel wool for removing stubborn build-up on existing shower doors), then spray and wipe the EnduroShield liquid into the surface. Thats it. Full instructions inside kit. EnduroShield not only creates an Easy Clean surface, but repels hard water, soap scum and grime, to keep the glass cleaner for longer between cleans. Doing away with the need for harsh, expensive and abrasive cleaners, investing in EnduroShield provides hassle free cleaning for as little as 83c per month. Kit cleans and treats up to 40 sq. ft. of glass or equivalent of the inside of one average shower enclosure. 90663 4 Inch Recessed Shower Lighting Kit, White Finish Globe Electric's 4" Damp Rated Shower Recessed Lighting Kit with round tempered frosted glass and white finish is the perfect way to brighten bathrooms with style. Designed with a water resistant seal to protect bulbs from humidity the pot light's housing and frosted glass trim are a perfect choice for damp locations like bathrooms, showers and saunas. Featuring patented PUSH-N-CLICK clips to grip uneven holds and surfaces installation is tool-free and easy. Fast and easy to install this kit is sure to save you time and money. Contractors agree! Requires one 35W equivalent MR16 GU10 light bulb (sold separately). Dimmable with compatible bulb and dimmer switch. The silicone gasket on this item is the seal between the glass lens and the trim. It is pre-sealed to help prevent moisture from entering the housing. 90663 4 Inch Recessed Shower Lighting Kit, White Finish is rated 3.7 out of 5 by 3. Rated 5 out of 5 by DDR from Very happy with this purchase Just remodeled our master bathroom and needed a new light in the shower. We installed 2 of these lights and I am very pleased with them. We have them on a dimmer switch which allows us to adjust them from very bright to a nice soft light.